The Peanuts were one of Japan’s first pop sensations, and the first to become well known internationally. Their career lasted from 1959-1975. The diminutive duo comprised identical twin sisters Emi and Yumi Ito, born Hideyo and Tsukiko Ito on April 1, 1941 in Aichi prefecture. The twins were discovered by music impresario and Watanabe Pro founder, Sho Watanabe. He first saw them performing at a club in Nagoya as The Ito Sisters, and in 1958 brought them to Tokyo, where they were re-named The Peanuts. Watanabe got them work as presenters on the newly launched TV show, The Hit Parade. Emi and Yumi looked exactly alike. Emi however had a mole near her left eye. To uphold the twin mirror-image Yumi drew on a mole of her own. In April 1959 they released their first single “Kawaii Hana (Cute Flower)”, and followed with the smash “Jyonetsu no Hana (Passion Flower)”. Their fame was cemented by a twelve year run (1961 – 1972) as the hostesses of TV show Shabondama Holiday (Soap Bubble Holiday). The show’s title came about as it was sponsored by a soap company. Because of their identical voices, the girls’ harmonies were magical, like pixies tickling your ears with aural fairy dust, similar to Anni-Frid and Agnetha, the singers of ABBA, who emerged in the same year that The Peanuts’ career ended. Granted, some of the magic was achieved by tape speed manipulation, but who cares! In 1963 they had a hit with “Koi no Bakansu (Vacation of Love)”. Also in 1963 they befriended the Paris-born German singer Caterina Valente, whose songs they had covered. This led to The Peanuts performing and becoming popular in Germany. Later, Valente in turn recorded a cover of The Peanuts’ hit “Koi no Bakansu”. The Peanuts also appeared on popular US variety TV shows, including The Ed Sullivan Show and Danny Kaye’s program. Other major hits included “Koi no Fuga (Love Fugue)” and “Sayonara wa Totsuzen Ni (Good-bye Is Sudden)”. The Peanuts also covered many American tunes, such as ‘Come On-A My House’ and ‘Mona Risa’! Emi married famed singer/actor Kenji Sawada, but later divorced. The Peanuts retired from show business with a farewell appearance on Nihon TV on May 25, 1975. They appeared on Kohaku Uta Gassen during all sixteen years of their life in the “geino kai”, or celebrity world. They exited while still young and popular, and remain fondly remembered show business legends. Emi (Hideyo Sawada) died on June 15, 2012 at the age of 71. Yumi passed away on May 16, 2016 at age 75. The girls’ international fame was due to their singing in monster movies. They were featured in, and sang the theme songs, to three Mothra movies – Mothra (1961), Mothra vs. Godzilla (1964), and Ghidorah, the Three Headed Monster (1965). For Mothra’s first three film appearances, the twin fairies or pixies, called “shobijin” (small beauties) were played by Emi and Yumi. They are referred to as the Cosmos in the Heisei Godzilla series and the Elias in the Rebirth of Mothra trilogy. In unison, they serve Mothra as liasons and interpreters, heralding the monster’s impending appearance by singing their worshipful ‘Mo-su-ra” tune. They used telepathic communication with Mothra and spoke for her, which gave the twins a somewhat supernatural aura. 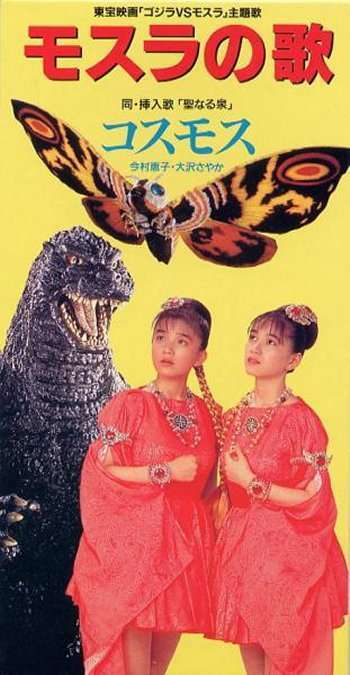 The twins demonstrate telepathic ability over great distances with Mothra. While the girls call to Mothra in prayer and song, they are also connected to the gentle monster on some deeper level beyond their control, and it is this connection that impels Mothra to find them no matter where they are. In Mothra vs. Godzilla the Shobijin also demonstrate teleportation, when trying to escape from Kumayama and Torahata. In Ghidorah, the Three-Headed Monster, the girls translate not only Mothra’s chirps but also an entire conversation among three daikaiju. They sing the theme ‘Let’s Try To Be Happy”. The twins bring a sense calming amidst all the rampaging monsters and explosions in the films. Their voices are the environmental and moral conscience to the human race, pleading for human patience and kindness toward the monsters. Decades later, in Godzilla: Tokyo SOS, two other shobijin (portrayed by Masami Nagasawa and Chihiro Ôtsuka) demonstrate telekinesis as well. The fairies’ famous song “Mosura No Uta” (“Mothra’s Song”) was written in Indonesian, though the Shobijin sing Japanese approximations to the original lyrics. The song was composed by Yuji Koseki. Other Japanese verses have been added by various composers over Mothra’s film history. The Shobijin have also been portrayed by Pair Bambi (Godzilla vs. the Sea Monster) and Megumi Kobayashi and Sayako Yamaguchi (Mothra Trilogy). The twins were in many other films, but the others were not shown worldwide, as the Mothra films were.